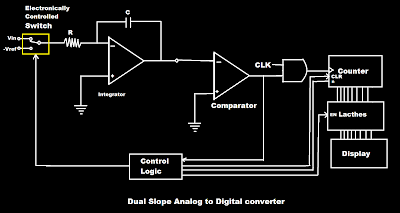 •There are basically 4 types of Analog to Digital converter (ADC). 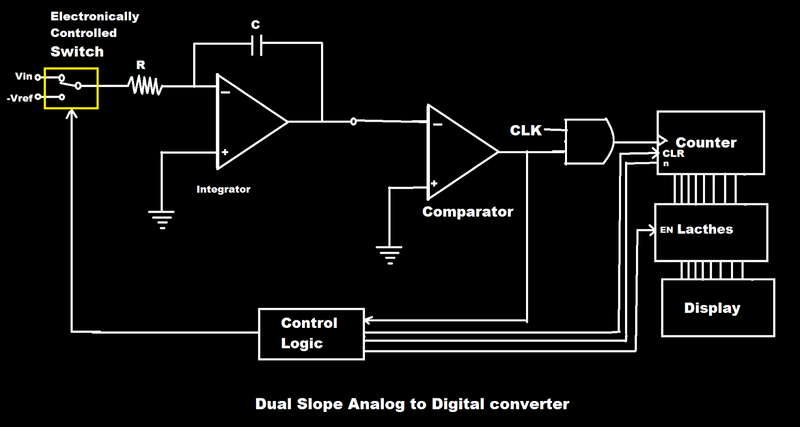 •Dual slope ADC is use for converting analog to digital value. •Dual slope ADC is slow but have high accuracy and have high resistance to noise. •This method is use in digital multimeter or digital voltmeter. •It is basically have integrator, comparator, control logic, clock, counter and electronically controlled switches. •Its operation requires two voltage slopes hence it is name as Dual slope. •The unknown voltage is applied to Vin and Known but with negative polarity voltage is applied to Vref. •Vin is for fixed amount of time and Vref is applied for variable amount of time. •One slope (/) is made due to unknown voltage. •The negative polarity voltage is then applied until it become zero means second slope (\) will form. 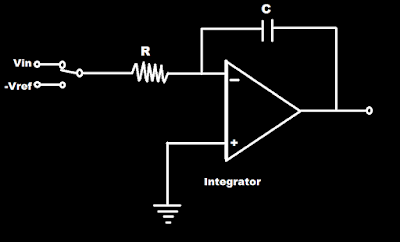 •The comparator is use to detect zero crossing. •Capacitor charges and discharges linearly with a constant slopes. 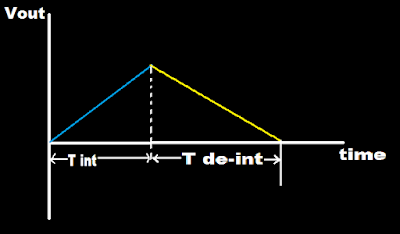 •T de-int is more than T int because discharging time of capacitor is more than its charging time. 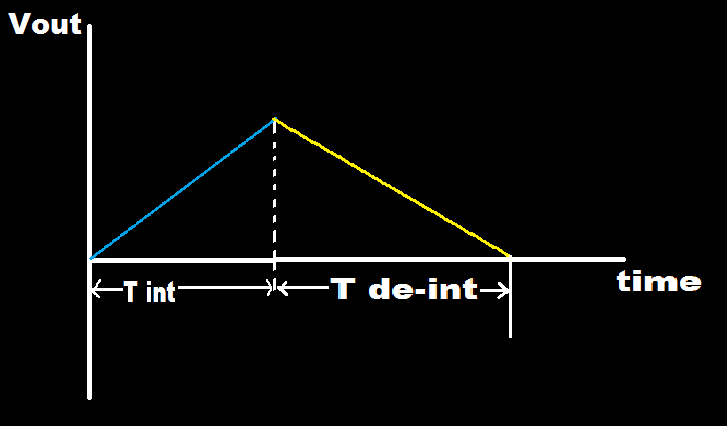 •If T de-int is large means large voltage and if T de-int is less means less voltage. •When the switch is at Vin position capacitor charges (charging time of capacitor is less). •And when the switch is at Vref position capacitor discharges (charging time of capacitor is more). Types of integrating type ADC. Explanation: An analog voltage can be converted to digital form, by producing pulses whose frequency is proportional to the analog voltage. These pulses are counted by a counter for a fixed duration and the reading of the counter will be proportional to the frequency of the pulses and hence, to the analog voltage. 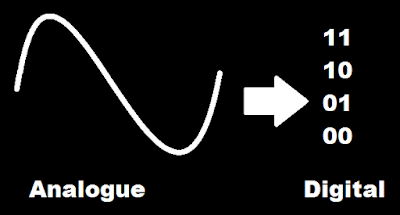 Voltage-to-frequency converter In these types of A/D converters, the voltage is converted (by a voltage-to-frequency converter) into a set of pulses repetition rate (or frequency) is proportional to the magnitude of the input. The pulses are counted by an electronic counter similar to the way the number of wavelengths was counted by the time-interval counter in the ramp-type DVM. Explanation: In this ADC, an unknown analog voltage and a known reference voltage are converted into equivalent time periods using an integrator, These time periods are measured by the counter. This circuit is called dual slope ADC because the analog voltage and reference voltage are converted to ramp signals of different slopes by the integrator. The dc voltage to be converted by the dual-slope converter, Vin, is fed to an integrator, which produces a ramp waveform output, The ramp signal starts at zero and creases for a fixed time interval, T1 equal to the maximum count of the multiplied by the clock frequency. An 8-bit counter operating at 1 MHz would there by cause T1 to be 8 µs. The slope of the ramp is proportional to the magnitude of Vin. The end of the interval, T1 the carry-out (CO) bit of the ripple counter causes the switch to move to the - VREF position. In this position, a constant current (- VREFI R) begins to discharge capacitor C. The ripple counter is reset to zero there is a Co. The count continues until the zero crossing detector switches state as result of capacitor C being discharged. The counter is stopped by the zero crossing detector, and the resultant count is proportional to the input voltage. In the following derivation it is important to observe that t, is independent of the value of Rand C.